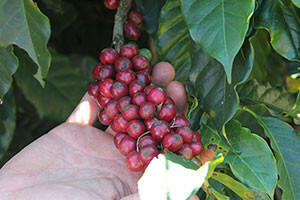 Guatemala “Finca Santa Isabel” Santa Rosa (Organic). Finca Santa Isabel started in 1899 by Federico Keller. Today, it is managed by Dieter Keller, Martin Keller and Alex Keller. It is located in Pueblo Nuevo Viñas, Santa Rosa, Guatemala, 64 km southeast from Guatemala City, and has its own wet and dry mill. Each coffee cherry at Santa Isabel is carefully selected, handpicked and then sorted, guaranteeing a consistent and high quality product. A very small amount of the coffees are natural processed and sun dried on state-of-the-art drying patios. This season 20 (150lb) bags were produced in this manner resulting in a very fruit forward profile. Ripe berries fill the aroma and flavor along with citrus notes and a graham cracker finish.